The $21 prix fixe includes two drinks, a coffee or tea, and an entree. 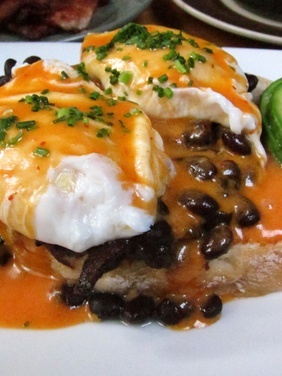 We recommend the Huevos Banados with poached eggs, chile hollandaise, grilled bread, beans, and avocado. If you get the chance, tell them to bring back the Crack Corn. Yep, that was really the name of it. And it was amazing. Not only does the $21 prix fixe include two mimosas, sangria or juice, refills of mimosas and sangria are only $1 each. That is not a typo! Just $1.